After Mass this morning, my mother, myself and my BFF Christine, headed over to a neighboring town and spent the morning looking at grey granite memorial headstones. I had spoken to one of the designers over the phone yesterday, when making the appointment, about what I was looking for in a headstone for Miss Courtney. He greeted us with some ideas already sketched out and after some discussion, we ended up with the above sketch. I think he did a really good job making what I had in my head a reality for my girl. What do you think? Flowers engraved around her photo, which is imprinted on a tile placed into the stone. Of course we had to have “You are my sunshine” on there. After all, I sang that song to her for every nap and night night for twenty-two years. She was our sunshine and our lives will never be as bright without her here. On the back of the stone, we have our family name so we can easily see it when walking through the graveyard. I chose the Celtic cross for her Irish heritage as well a being a nod to my Papa who pre-deceased her. Then there is Jeremiah 29:11 which is her “verse”. One we chose for her many years ago. God did give us hope and we were always assured of His love and provision. Even now that she is gone, that continues. It will be put in place on August 14, 2015, four days before what would have been her 23rd birthday. Perfect timing don’t you think? Thank you for making this possible. You have once again created a miracle for our daughter. I love the headstone sketch! I look forward to seeing pictures of it in place. 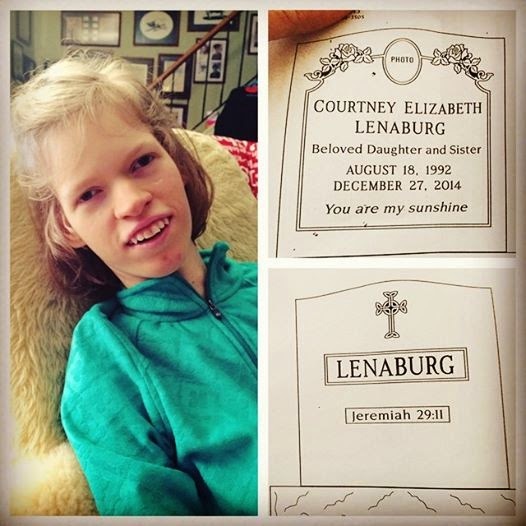 Courtney, please pray for all of us! Wonder whether it's OK to like a tombstone, but then I do. It's very pretty, appropriate for your Courtney. Jeremiah 29:11 is such a powerful verse! I have it right here on my desk and see it every day. Blessings to you as you get your Mother's Day wish! I continue to pray for you all every time I see your or Courtney's face 🙂 True Sunshine – both of you.